A team of researchers working with diving company One Ocean Diving recently came upon on rare sighting of Deep Blue, a massive great white shark believed to be the largest of its kind on record. The diving team spotted Deep Blue, who's believed to be more than 50 years of age, some 20 miles off the southern shores of Oahu, Hawaii News Now reported. Researchers steered clear of giving a more exact location out of concern for public safety. ​Pictures and recordings of the jaw-dropping encounter show divers getting up close and personal with Deep Blue as she swims back and forth to an area where a dead sperm whale was located. Researchers are speculating that Deep Blue may be pregnant. 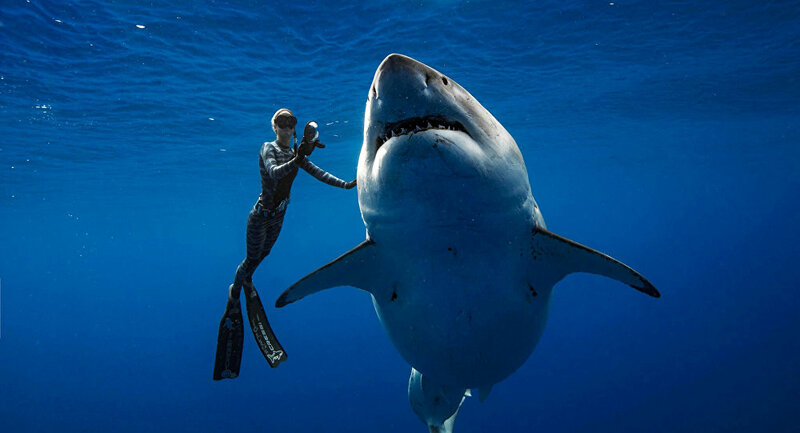 ​"This individual may be one of the largest recorded and bears similar markings to 'Deep Blue', a shark I've studied in Isla Guadalupe, Mexico, where I've done most of my work with white sharks," Ocean Ramsey, one of the researchers who swam with Deep Blue, told the New Zealand Herald. "This gentle giant swam up and brushed up against our boat repeatedly. There is a theory that large females come here when they are possibly pregnant, trailing whales." ​With a decent following on social media, Deep Blue has become something of an icon. Fans of the reportedly 20-foot long gal frequently fawn over new footage when it's uploaded and shared. "Love this big beautiful girl," one netizen wrote when Deep Blue was spotted in Mexico back in 2015. "What a spectacular sight." Last spotted in Mexico in July 2018, Deep Blue earned her crown as one of the biggest great whites in 2014 during an episode of Shark Week, according to Motherboard, which cited researcher Mauricio Hoyos Padilla as giver of the title. But not everyone agrees that Deep Blue is in fact the biggest shark out there. Michael Domeier, president and executive director of the Marine Conservation Science Institute, told the publication that the claim was just a "Discovery Channel gimmick." Ouch. ​"I led the white shark research project at Guadalupe Island and first documented Deep Blue in 1999, 20 years ago… Deep Blue has never been measured, so how could anyone make that statement?" he questioned. While Deep Blue's actual measurements are still up for argument, Domeier did suggest that the shark was possibly pregnant and that she was likely to head back to Mexico's Guadalupe Island after giving birth. Get ready folks: this upcoming fall, there's going to be a new kid in town.